feed format and archive section through Apple TV. 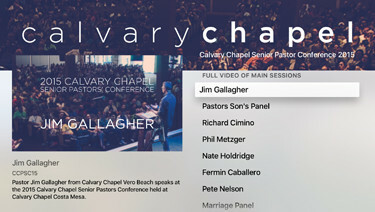 The CalvaryTV app is designed, developed and maintained by the CalvaryChapel.com team. The purpose of the app is to present live and archive versions of video and audio content through a platform that is easy to use for both individuals at home and for group settings such as church gatherings. The goal is to continually expand this library of media resources for the equipping, encouraging and edifying of those desiring to know more about the Bible and Jesus Christ. We ask that you partner with us in our endeavors as we continue to develop the CalvaryTV app. We ask for prayer, donations, advertising, ideas and volunteers. Pray for wisdom in knowing how to proceed with the development of the app. Pray that the app is a blessing to many and that what they watch or hear will help in their understanding of the Bible. Give Back. Donations will help cover costs for bandwidth, storage, live video feeds, rendering time for the digitization of analog content and advertising. Advertising and promoting the CalvaryTV app through mediums accessible to you, your church or business such as social networks, websites, announcements from the pulpit and by word of mouth. Submission of ideas of what you would like to see on the app or particular functionality of the app. We look forward to partnering with you in the development of the CalvaryTV app. © CalvaryGlobal.tv All rights reserved.